One day my sophomore English class convened to find, on each desk, a blank piece of paper. Our teacher wore a serious expression. “Today is lottery day”, she announced. We silently shuffled our mental files, arriving quickly at Shirley Jackson’s short story The Lottery that we had read earlier in the year. We looked at Mrs. Gerhardt inquiringly. She told us to turn over our papers – she had one, too. A young woman had the black spot. Another pause. Mrs. Gerhardt crumpled her paper and threw it at the chosen victim. We followed suit, littering the classroom. There was a collective sigh… Release of tension? Discussion followed. The “victim” was asked how she felt. “I knew you wouldn’t really hurt me.” My high school did not protect us from controversial and potentially upsetting literature. Wikipedia tells me that The Lottery (published in 1948) was so unpopular and notorious that it was banned in some jurisdictions, and Jackson received hate mail. Some would define the theme as “it can’t happen here”. How many teachers can teachers can plan a class that you remember FIFTY YEARS later? Mrs. Gerhardt was a wonderful, stimulating teacher. She took us seriously as readers and writers. Sophomore year was reserved for American literature, with the usual deviations. Every year, we read one play from Shakespeare (sophomore year, maybe it was MacBeth), worked our way through a grammar text identified only by the name of the author (Warriner), and gobbled up vocabulary from a book calledWorld Wealth. We got SO good at grammar and vocabulary! That left at least 70% of our classroom time for other pursuits. What did we do? We read! Sometimes we read plays. I was cast as the mother in Our Town by Thornton Wilder. Two boys with theatrical inclinations performed Edward Albee’s Zoo Story. And once each semester, we had a “Folk Day”. We prepared and shared whatever we wanted, so long as it had some relationship to American folk culture. This was in the day of the “hootenanny”, of folksingers Peter, Paul and Mary, of Bob Dylan. Folk Day was wildly popular. A friend and I sang an old English folk song, a love ballad, accompanying ourselves with guitar and recorder. He is not there, there’s only the pod. Really?! Was the author kidding us? Has anyone else got such a silly bit of drivel stuck in his/her brain from decades ago? Please share under comments. Using Amazon, I confirmed that this book was published in 1962. Used copies are available! Genealogy fans take notice. I already wrote about the journals Mrs. Gerhardt required of us. See my blog entry of July 8, 2016. Fifty years of my journal writing has been consigned to a reliable archive. Another activity from sophomore English was the Book of the Month competition. I think it actually happened four times a year. This wasn’t just an oral book report. You had to “sell” your book as the “best” book, make everyone want to read it. The class voted, and two books (there were two sections of Honors English) would be posted as winners. Once I went all out. I read Zorba the Greek by Nikos Kazantzakis, and plugged it as exciting and patriotic. And I won! But the other class, in a fit of mischief, all agreed to vote for someone who did a terrible job on a perfectly awful sounding book. Mrs. Gerhardt, offended, posted my name and winning title/author in lonely splendor on the classroom bulletin board. Rest in Peace, Mrs. Gerhardt! You enriched our lives and kept us busily occupied through a year of adolescence. If YOU had a wonderful teacher in high school, please share! Published in 2004. Translated from Swedish in 2014 by Thomas Teal. Paperback by Vintage Books, 2014. 278 pages. This cheerful book delves into two of my amateur interests, entomology (the biology of insects) and art history (with emphasis on art theft and forgery). I hang out with entomologists, and visit art museums casually. 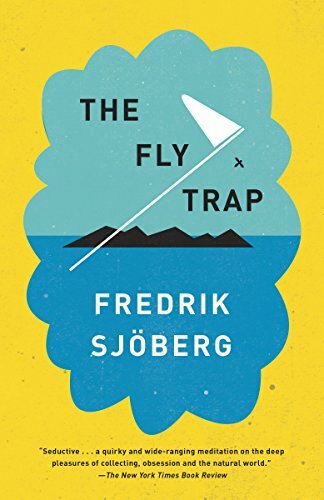 The Fly Trap is both memoir and biography. As Sjoberg’s personal memoir, it is the first volume of a trilogy. The next two books are The Art of Flight (2016) and The Raisin King. One reviewer suggests that these three books might also be categorized as travel, natural history, popular science or even poetry. The “fly trap” of the title is a collecting device used by entomologists and called the Malaise trap. It is named after it’s inventor, Rene Malaise (1892 – 1978). According to Wikipedia, Malaise was an eccentric Renaissance man, and little was written about him before Sjoberg produced somewhat biographical this book. With a mix like this, the book was bound to be interesting. It is enhanced by Sjoberg’s whimsical, non linear style. While studying Malaise, Sjoberg “caught” the art collecting passion, described in the book’s final chapter. I recommend this book if you like the out of doors, natural history and/or bugs. Also books, art and travel. This book is fun, and useful to anyone looking for suggestions in the category of modern fiction and (to a lesser extent) non-fiction. Brown and I have several things in common. We’re both frustrated book reviewers. We both have blogs. His is at www.thebookshopper.org Neither of us is listed in Wikipedia. Or if Murray Brown IS there, he’s lost among a crowd of other people with the same name. The memoir aspects of this book are as interesting as his opinions about books. One early influence was his grandmother, who loved books, patronized her local library and eventually asked her grandson to pass along his copies of the New York Times Book Review. Did you ever hear of “competitive reading”? In eighth grade, Brown (unable to win distinction as an athlete) decided to read the most books of any pupil in his class. At the end of the school year, he received a trophy. Would he have been happier with a free meal at Pizza Hut, the bribe offered to my sons in elementary school? One way or another, some of us get hooked on books. I was on vacation (in Alaska) and had promised myself I wouldn’t buy gifts for family and friends – I was trying to travel light. But when I saw this book, I had to have it! Memoirs about Alaska’s early days are numerous, but this one stood out because of the identity of the editor. Jane Jacobs is identified on the book cover as author of The Death and Life of Great American Cities. Yes, that Jane Jacobs! A Google search of her name yields 22 million hits! Okay, it’s a pretty common name, but I’ll bet the majority refer to the “American-Canadian journalist, author and activist” smiling out at me from Wikipedia (but modestly absent from the book). Hannah Breece, sadly, is not listed in Wikipedia. I hope this is remedied soon. How did Jacobs-the-activist end up editing this 193-page memoir? In a sense, she inherited the job. Hannah Breece was Jane Jacobs’ aunt. Late in Ms. Breece’s life, when she had retired to Oregon, acquaintances urged her to write about her experiences teaching in Alaska from 1904 to 1918. She asked friends and relatives to return her letters, and used them to assemble a memoir. It was not published. Jane Jacobs admits she was put off by the racism, sexism and colonialism detectable in her Aunt’s writing, though they were merely a reflection of the times. Hannah Breece died in 1940, and Jane Jacobs published the memoir in 1995! She added detailed commentary that tremendously enhances the value of Ms. Breece’s record. Under the heading of “Puzzles, Tangles, Clarifications”, she addresses the social and political climate of Alaska, its relation to the rest of the US and numerous omissions in the memoir. (In fact, Ms. Breece had left out a great deal.) Jacobs offers seven brief essays clarifying various points. My favorite was #6, entitled “Miraculous Rescues”. Make no mistake, Hannah Breece was very fortunate to have survived her time in the wilderness. Any newcomer to Alaska had to be smart, strong and LUCKY to deal with the hazards of climate, wildlife, topography and lack of government. Ms. Breece recounts two experiences that “should” have killed her, for which no “rational” explanation of her survival can be offered. Jacobs doesn’t back off from this complex territory. She assigns one experience (a near drowning) to the category of “intuition”. Before crossing a frozen bay, Ms. Breece felt “irrational” fear that was readily explainable after the fact. The second experience was more complex. Perhaps, suffering from hypothermia, Ms. Breece hallucinated. She was helped by a person who wasn’t there. In her dire need, did she remember someone strong and competent from her childhood? Now that I’ve read it, I’ll pass this book along to the intended recipient. It’s a good thing he likes used books! When I was four years old, I would hear the doorbell and run to see who was there. Often I would dash off and report to my mother or father “It’s the Fifty Cent Boy!” They knew exactly what I meant. We received two newspapers daily, the Hartford Courant in the morning and Hartford Times in the evening. Each was delivered by a teenaged boy, and the fee was fifty cents (each!) per week. That money was collected with meticulous regularity. I believed in the Fifty Cent Boy. He was much more real than Santa Claus. Newspapers were important in our household. I used to wonder how my parents could stare for so long without turning a page. Must be very interesting! I got hooked by the time I was ten. Predictably, my first obsession was the “funnies”. I read them lying flat on the floor. The ink was cheap and blackened by elbows. I got in trouble if I was wearing a light colored, long sleeved shirt. If bare armed, I was nagged to wash my elbows. We used to argue over who got which section first. Usually there were three of us arguing over four sections, but no one was really going to preempt my Dad. My sister soon developed an interest in “Dear Abby”, so she would settle for the women’s section. Where WERE the comics? Was it at the back of the sports section? Or the back of the classified ads? Wherever they were, it was consistent. It took me a while to develop an interest in the front page and the editorials, but over time, it happened. I missed the familiar papers when I went away to Michigan for college. Mom (a faithful correspondent) mailed me the occasional comic strip. When the bomb squad got called to my high school (due to an error in ordering chemicals for the science lab), Mom sent me the news article. But there was a newspaper at Michigan State University! Called, I think, the Michigan State News and billed as “Michigan’s Largest Morning Daily”. I think the only higher-circulation paper in the state was the Detroit Free Press, locally known as “The Freep”. I was charged two dollars per semester for the Michigan State News. Once at registration, I was approached by a friend who had a full tuition/room and board scholarship. She had come to registration without her wallet. She needed two dollars to pay for the newspaper, or she wouldn’t be able to complete registration. I helped her out. I liked the Michigan State News, though I don’t remember much detail. Later, I went to graduate school at a university that also published a daily paper. This is an advantage of a large institution! Next, I fetched up in York, PA. There must have been a newspaper, and I did read it. But did I have it delivered? By the time I got acquainted and felt an interest in local issues, I was gone. Two years is a short time to live in a community. Then I moved to New Jersey. Two newspapers competed for my attention, the Press of Atlantic City and the Philadelphia Inquirer. Getting both seemed silly and (in those pre-electronic days) generated too much waste paper. At what point did I start worrying about conserving paper? Maybe 1980? For a time, I assumed I needed the Press, since I worked for local (county) government. Why didn’t a copy automatically turn up at work?? The Inquirer fell by the wayside. For a few years, we supplemented the Press with the Washington Post Weekly, a compendium that emphasized editorial content. I liked it. But almost every week, the cover showed an enlarged version of the most controversial or amusing editorial cartoon. Have you ever tried to explain editorial cartoons to a bright and curious six year old? Week after week, we confronted symbolic and allusional graphics. Why is that man waving a coat hanger? What’s bad about the elephant? Who knows what misconceptions my hasty explanations may have been planted in my son’s impressionable brain? Then followed my long and ambivalent relationship with the Press of Atlantic City. Why did they insist on sending me the Cape May edition? If I lived on the other side of the street, I would have gotten the more relevant Atlantic County edition. Eventually, we switched to electronic delivery, but the problem about which edition did not disappear. Our subscription got scrambled, and now I’m limited to a few articles a month. I seem, however, always to have access to obituaries. Parallel to all of this, two other news sources have been valuable to me – the Chronicle of Higher Education and the New York Times. The electronic version of the Chronicle is available to me at work, fully enabled for prime content. Yea! I try to limit the amount of (work) time I spend with it. High quality writing, links to good blogs (I like the one called Lingua Franca), issues that matter to me (like campus climate and incidents following the election). Then there’s the New York Times. Always there. Stockton University (my employer) has an educational deal with the Times, so any student can get an on-line subscription, and free print copies are delivered to campus five days each week during the academic semester. The expectation is that some faculty members will use the Times in their classes. I certainly would if I was still teaching. Their coverage of climate change is high quality. I really should give in and send the Times the few dollars they request for an on line subscription. Meanwhile, I enjoy the print copies, though to some extent I had to “relearn” how to read the Times after spending too much time on line with CNN and other “lite” news sites. Times articles are sufficiently complex that you don’t always realize from the headline that you will find the article worthwhile. So where does all of this leave me? I don’t watch TV news. I check CNN on line daily. I get news from Facebook. The age of newspapers as my “major” news source is over. What stimulated this flood of reflection? This morning I walked into my local diner, and my husband picked up the Press of Atlantic City. “Look, an artifact!” he exclaimed. A print copy! Print circulation is dwindling away. Farewell to my favorite news medium. I didn’t like the title of this book. “Faitheist” sounds contrived, and the subtitle describes the book perfectly well. I relented a little on learning that “Faitheist” was first used to Stedman as an insult from an angry atheist who thought Stedman was “soft” on Christianity. Shows how little I know about contemporary atheism. It’s a movement, not a description. But that’s not the point of the book, which is fundamentally an autobiography, a very lively and interesting first person text. Stedman is young, born in 1987 in Minnesota, the kind of intense child who took EVERYTHING seriously. He joined a “born again” Christian congregation shortly before he recognized his homosexuality. His pain and distress at the prospect of eternal damnation drove him to consider suicide. His mother and a sympathetic Lutheran pastor dragged him back from the brink. Spiritually, he developed into an independent atheist. The real purpose Stedman found in life was social activism at the intersection between different religious groups and, later, between the “religious” and non-believers. He reached the important conclusion that “tolerance” between those of different spiritual paths is not enough – genuine respect is needed. It can only develop from deep friendship and careful listening. Stedman now works as Director of the Yale Humanist Community at Yale University. Oddly, he never mentions Ethical Humanism. Recently, a friend of mine observed that when President Barrack Obama discusses religious diversity, he generally includes non-believers as well as practitioners of all the world’s religions. Did Obama pick this up from the Unitarian Universalist congregation his family associated with? Stedman, whose family was decidedly secular, passed briefly through a UU group before his conversion to Christianity. I mentioned a prominent atheist in a blog post dated January 31, 2014. This was Richard Dawkins, author of The God Delusion, whom I found to be unpleasantly condescending towards religion and religious people. I looked a little into the controversy around Stedman. He has been accused of “shielding” or apologizing for Christianity and failing to acknowledge its problematic behavior. The best thing about Stedman’s book is his willingness to tell his own story. I think he recognizes the equal importance of listening to others’ voices. The US is in serious need of this type of respectful dialog. This book falls into two of my favorite reading categories – memoirs, and history I “lived through” but may not understand well. The history in question is the Cuban Revolution, which Wikipedia dates to January 1, 1959. Of course, what I remember best is the Cuban Missile Crisis in October of 1962. I expected nuclear war. Carlos Eire is about one year younger than me. His childhood ended at age 11, when he was put on a plane from Havana to Miami, accompanied only by his 15 year old brother. Waiting for Snow in Havana is an amalgam of memories, highlighting Eire’s parents, brothers, friends, teachers and neighbors. His father was a judge, hence a member of the “establishment”, but not so close to the old regime as to have been immediately targeted for execution by the Revolutionaries. Eire lived a life of privilege and received a good education. Catholicism dominated the culture in many ways. The decision to send Carlos and his brother to the US on their own was made by his mother, who eventually followed them. His father never left Cuba. Eire’s childhood memories are dominated by danger and death. Danger, because many of the pastimes and activities would put at contemporary parent into shock – rock throwing as a socially sanctioned game, surfing in rough seas… Death, because so many actions were thought to be deadly – going from a warm room to a cold room, etc. The book is also permeated by anger, especially at the Revolution, at Castro and Guevara and the changes they imposed on Cuba. Eire is still angry. A quick Goggle search makes it easy to find out the details. Eire knows that his own adult voice permeates the book, although it is intended to express his childhood in its own terms. If you like memoirs about childhood, read this book. It also sheds (some) light on the immigration and foreign policy issues we now face.